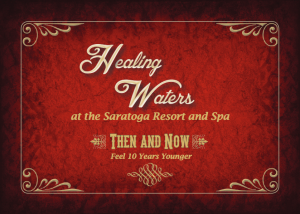 Since their discovery, the mineral hot springs at the Saratoga Hot Springs Resort have been revered by many for their naturally healing benefits. 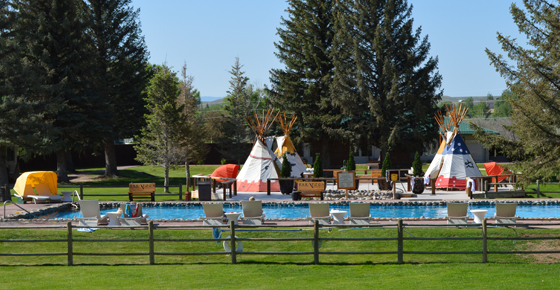 Come soak away your cares in teepee-covered hot pools and the 70-foot-long mineral hot springs pool. 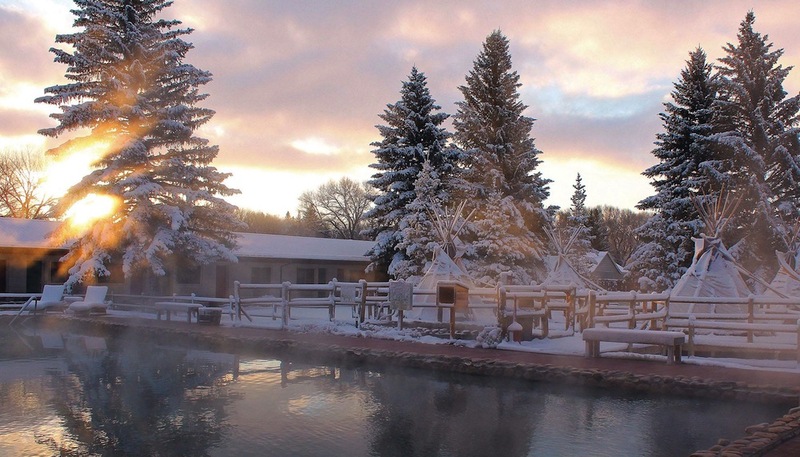 The incredibly high mineral content and low sulfur odor ranks these mineral hot springs with the world famous German springs. 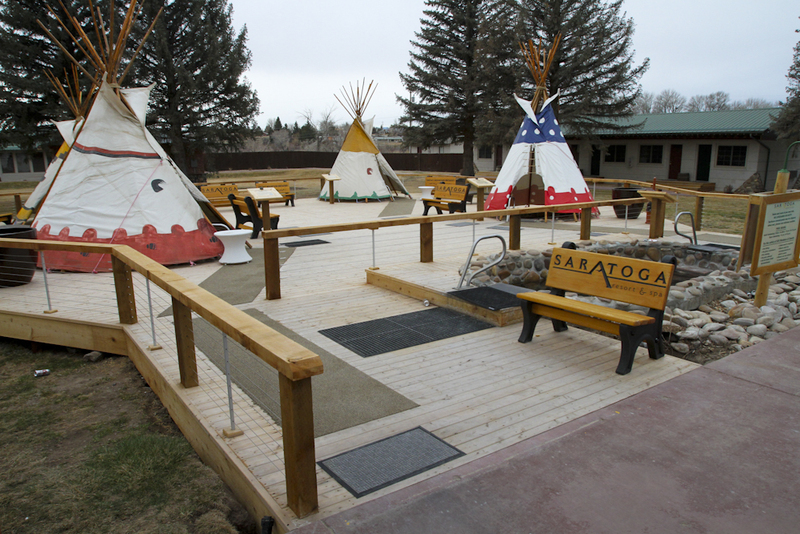 Native American tribes (Cheyenne, Ute and Arapaho), were the first to discover the healing advantages of the natural mineral hot springs, naming the area the “place of magic waters”. The medicinal benefits of a tranquil hot springs soak continues to attract visitors today. 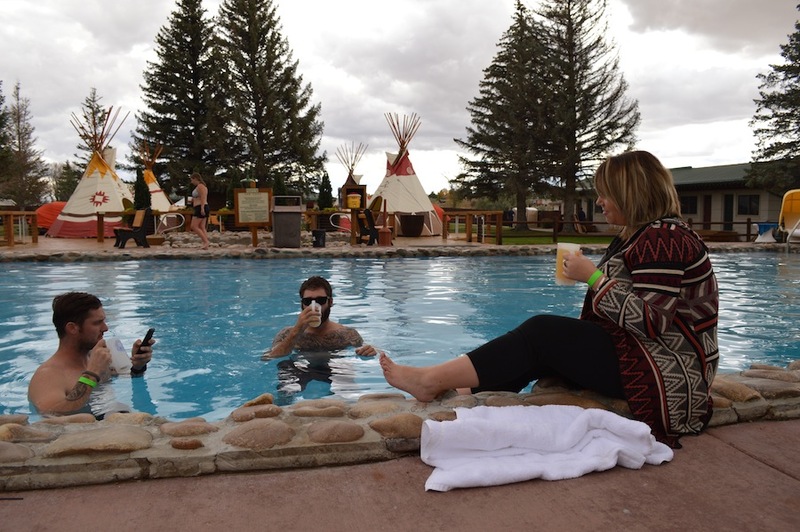 Our guests are invited to soak in intimate teepee-covered pools and a 70-foot mineral hot springs swimming pool after an active, adventurous day in Wyoming’s great outdoors or as a prelude to one of our soothing spa treatments in the Healing Waters Spa. 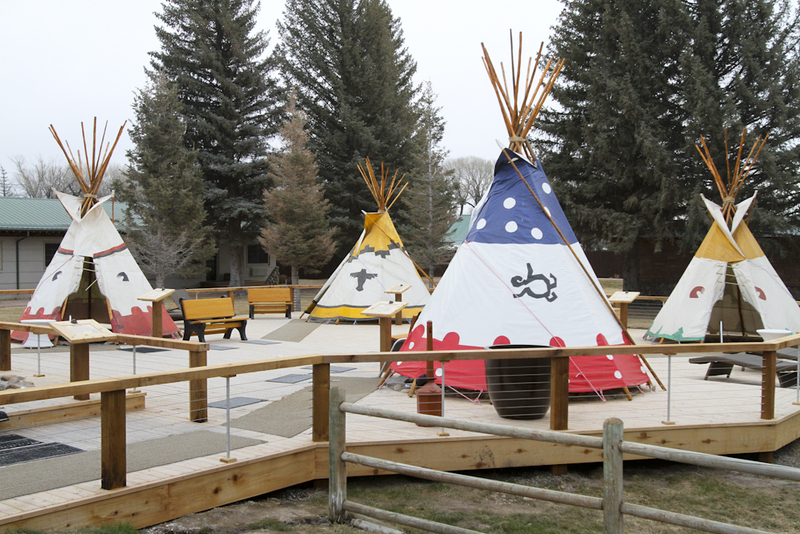 Our small, teepee–covered hot pools are closed on Wednesdays from 7am-5pm for weekly cleaning. However, the large hot pool will remain open during this time. Please note: The hot pools at the Saratoga Hot Springs Resort are available exclusively to our guests and members only. Teepee covered private pools are available on a first come basis, we do not reserve them. Are the hot pools open to the public? The hot pools are for guest use only. However, all spa treatments include day use of the fitness center and the mineral hot springs pools, as a prelude to one of our soothing spa treatments in the Healing Waters Spa. 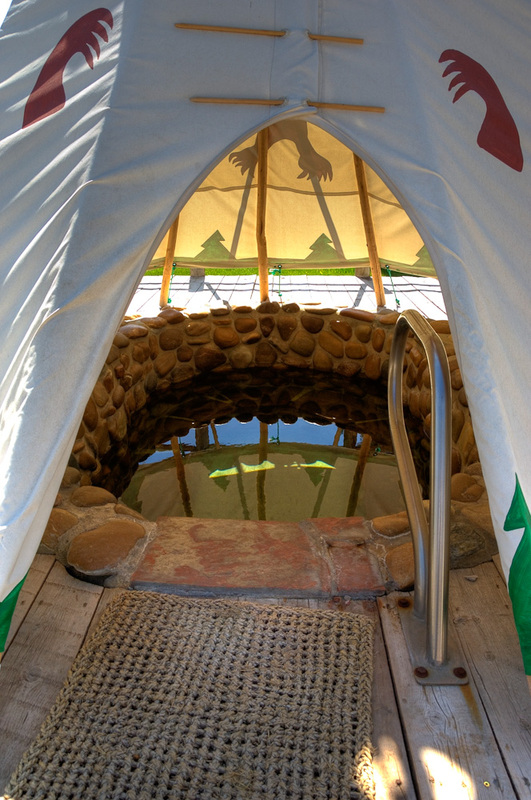 Do you reserve the teepee hot pools? 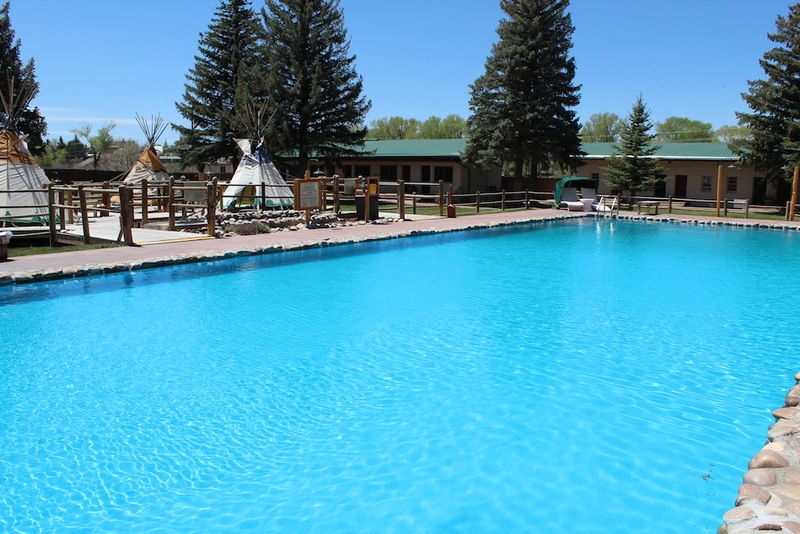 The teepee mineral hot springs pools are available on a first-come, first-serve basis. We do not reserve them. Where can I get a robe to use at the hot pools? Robes are available for a rental fee of $5 per stay, at the front desk. Complimentary robes are available in our guest room suites for use during your stay. What is the average temperature of your hot pools? 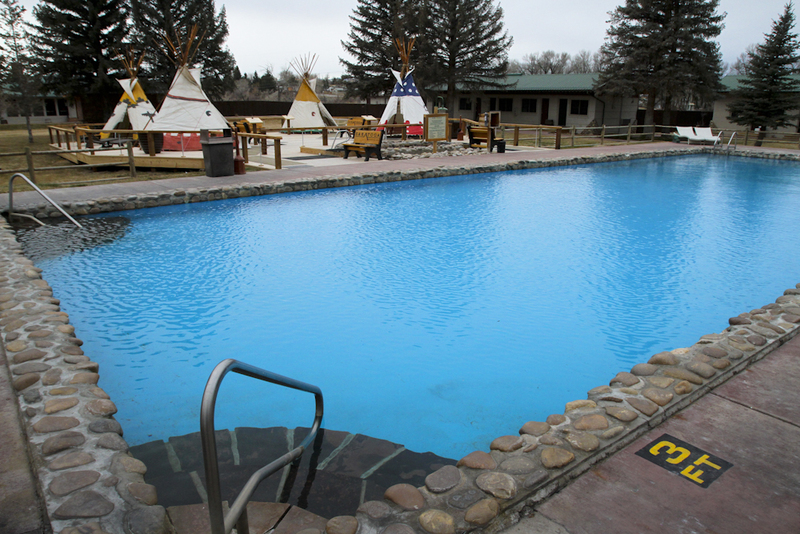 The teepee hot pools temperature is approximately 100º–112º . The 70-foot mineral hot springs swimming pool is approximately 96º–98º degrees. Please note that the heating of the pools is 100% natural, and completely dependent on Mother Nature. The temperatures of the hot pools can fluctuate greatly at times, throughout the various seasons. Is it okay to enjoy a glass of wine or beer poolside? Glass is prohibited in the hot pool area. However, you are welcome to ask for a plastic cup at the Snowy Mountain Pub and Brewery and enjoy your beverage poolside. *Swimming while under the influence of alcohol is not allowed. I forgot my swimsuit. Can you recommend a place to get one? Swimwear, board shorts, towels and sunscreen are available for purchase at the Healing Waters Spa, located at the back of the hot pools courtyard. Balneotherapy is the treatment of medical conditions by bathing in naturally occurring heated mineral water. It is an ancient practice that has been used throughout history for the treatment of many diseases. Although contemporary medicine has been slow to establish the scientific basis for the benefits of submersion in mineral-rich hot springs water, a long history of use strongly suggests medicinal benefits. It is widely recognized that a tranquil hot springs soak provides relief from the pain of stressed muscles and tired joints. The complex effects of hot springs minerals on the skins glands and blood vessels is the likely explanation for the numerous subtle benefits that are reported by those in tune with the hot springs way of life. Modern balneotherapy is most often used for muscle and skeletal disorders, including osteoarthritis, joint pain, psoriasis (including associated psoriatic arthritis), and swollen spine. Balneotherapy has also been suggested to improve conditions associated with heart disease, fibromyalgia, chronic fatigue syndrome, depression, insomnia, headache, muscle soreness, injury, low back pain, spinal cord injury, muscle spasms, stroke, acne, dermatitis, eczema, and many other conditions. Saratoga natural hot springs contains sulfur at the concentration of 191 mg/L. Sulfur, at this concentration, has been effective in the treatment of psoriasis, eczema, dandruff, folliculitis (infected hair follicles), warts, and pityriasis versicolor, a long-lasting skin disorder characterized by patches of skin that are a different color from the usual skin tone. Well-designed studies, most conducted in Israel, suggest that balneotherapy can help treat several different kinds of arthritis, including osteoarthritis (OA), rheumatoid arthritis (RA), and psoriatic arthritis. People who took sulfur baths and other spa therapies improved strength, had less morning stiffness, had better walking ability, and less inflammation, swelling, and pain in joints, particularly in the neck and back. Mud packs and Dead Sea salts dissolved in a regular bath tub also improved symptoms of arthritis, but not as effectively as soaking in the Dead Sea itself. Silica (57 mg/L) has been shown to contribute to certain enzyme activities that are nec­essary for normal collagen formation. Collagen is the most abundant hu­man protein and is found in skin, ligaments, and tendons. Proper collagen formation is essential for maintaining tight, wrinkle-free skin, so silica can also be beneficial for slowing down the signs of skin aging. Silica is essential for maintaining the health of connective tissues due to its interaction with the formation of glycosaminoglycans which are structural building blocks of these types of tissue. One well-known glycosaminoglycan important for skin health is hyaluronic acid, which has been shown to promote skin cell proliferation and increase the presence of retinoic acid, improving the skin’s hydration. Silica is believed to restore health to aging skin, hair and nails. Sulfates (576 mg/L) play an important role in the formation of brain tissue, joint proteins and the proteins that line the walls of the digestive tract. They stimulate the pancreas to generate digestive enzymes and are thought to help detoxify the body of medicines and environmental contaminants. Calcium, the most abundant mineral in your body, is required for developing and maintaining strong bones and teeth, according to the University of Maryland Medical Center. About 99 percent of the calcium in your body is stored in your bones and teeth. Calcium requires the presence of phosphorus, magnesium (Saratoga concentrations: 8.8 and 0.5 mg/L respectively) and vitamins D and K for adequate absorption. If you have a calcium deficit, it may cause or contribute to conditions such as osteoporosis, hypertension, elevated cholesterol and rickets. Chloride is an electrolyte that works with sodium, potassium and carbon dioxide to maintain the acid-base balance in your body and to keep the proper balance of body fluids. Phosphorus, the second most abundant mineral in your body, helps build strong teeth and bones, filters out waste in the kidneys and helps your body store and use energy. Phosphorus plays an active role in tissue and cell growth and repair. Potassium is active in muscle-nerve communications and in moving nutrients into cells while moving wastes out of the cells. Sodium is essential for your body to maintain the proper fluid balance, transmit nerve impulses and assist in muscle contraction and relaxation.